Our most effective and long lasting flymask. Treated with our Vamoose technologyExtremely durable textilene body, soft polyester ear material, comfortable fleece edging with Vamoose technology for the ultimate protection against flies and the damaging effects of sunlightImproved design for optimum eye protection, detachable nose protection, large fitting soft ears, adjustable closures with elastic to allow the horse to graze comfortably. 95% would buy this product again. Super nice sturdy mask, good fit fits nicely. 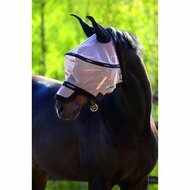 Fly mask fits, does not rub, does not press on the eyes, horse is very happy with it. This is a mask of very good quality. Nevertheless, it is necessary to pay attention to the horses which have a short head but which are quite wide of cheeks! Just got it in can not tell how it is in use. The size fits well size cob for arab. Ears are a bit too big. Question: Is the nose patch included? Answer: The nose patch is standard on the mask, but it can also be removed with the Velcro fastener. Answer: Here is a strengthening of the eyes. Question: Horse stands 24/7 on the meadow so in all weather conditions, the means that is used with this mask is released during rain showers etc. so that this can come in the eyes, nose and mouth. Answer: The blanket and the technology has been tested and is safe for the horses. Horses can therefore stand outside in bad weather. 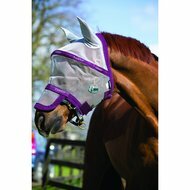 Question: Is this fly mask UV-resistant? Answer: This fly mask is UV-resistant.